Musheir El-Farra is originally from Gaza and is a leading figure in the Sheffield Palestine Solidarity Campaign. 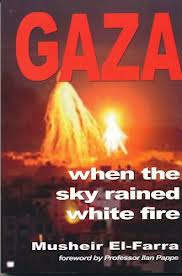 He is speaking at meetings across Scotland about his book which contains first person accounts from families in Gaza about what they endured during Israel’s invasion and massacre during Operation Cast Lead in 2008-09. Since then, the UK has continued to sell arms to the Israeli regime, including parts for the drones that patrol the sky over Gaza. How do Palestinian human rights activists and international and local organisations support Palestinian communities at risk in the occupied West Bank? How do Palestinians continue to assert their rights to their homes and land when entire communities are threatened with forced eviction? What does Israel’s expansion of illegal settlements mean for Palestinians on a daily basis? What role can the international community play, including people in Scotland and the rest of the UK? Hamed Qawasmeh will address these and other questions with a focus on the Hebron region in the southern West Bank, as a window onto Israel’s continuing violations in the 60 per cent of the West Bank under full Israeli military control, known as Area C. Hamed directs the Hebron International Resources Network, is an activist in the Villages Group, and also works for the UN, documenting human rights violations in the southern West Bank. He will share his experiences and those of the communities he works with, and discuss the impact of Israel’s policies on the ground. Hamed is from Hebron and previously worked for six years for the UN Office for the Coordination of Humanitarian Affairs in the Occupied Palestinian Territory. The event is free but donations are appreciated. All welcome. A two day conference bringing international speakers and groups and organisations actively supporting the Palestinian call for a campaign of Boycott, Divestment and Sanctions (BDS) aims to build on boycott successes and growing civil society support for Palestine in Scotland and around the UK. Divestment of public, workplace and church pension funds from companies, Israeli or otherwise, complicit in Israel’s daily violations of Palestinian rights is a vital part of our solidarity work. During the struggle against South African apartheid, churches, trade unions and campaigners were part of the world-wide divestment movement. It is now time to follow the example of others by divesting from Israeli occupation, colonisation and apartheid. Please register for the conference here (£20 or £10 concession). You can also register by post. This conference will help take the first steps in launching effective divestment campaigns in Scotland. Speakers from Canada, the US and Norway are coming to share their experiences and skills. To ensure the conference is a success your support is needed. Donations can be made via the SPSC website or by mail to Scottish PSC, c/o Peace & Justice Centre, Edinburgh, EH2 4BJ. Please mark all correspondence with reference to ‘Time to Divest Conference’. E-mails can be sent to divest@scottishpsc.org.uk. Why is Gaza’s Ark needed? Restrictions by the Israeli government on the freedom of movement for Palestinians in Gaza have been increasing for decades; trade restrictions have been imposed by Israel upon Gaza since 2001, with a near total ban on exports since 2007. Goods are only allowed in and out of Gaza through one, severely limited gate on its border with Israel; its airport is no longer functioning and cannot be rebuilt; and ships – including fishing boats – are banned beyond three nautical miles from the Gaza shore (the only Mediterranean port closed to shipping). Together, these restrictions have converted a once-productive economy into a dependent society in which 80% of the population relies on UN handouts to live. What do we hope Gaza’s Ark will actually accomplish, given that Israel has used violence to stop other boats from leaving or entering the port of Gaza? National governments and international organizations have refused to hold Israel accountable. It is up to civil society to take action on its own. Every step of the way as a boat is purchased in Gaza, refurbished and stocked, we will reach out to international media, human rights organizations, businesses, trade unions and other key civil society stakeholders to raise awareness, educate and mobilize them to action through public endorsements, letters to the editor, social media campaigns, etc. It will take massive, sustained public pressure to push international bodies and governments around the world to force an end to the Israeli blockade. Gaza’s Ark will help create that pressure. This is your opportunity to come and hear more about the Freedom Flotilla Coalition, its foundation and how you can help. A collection will be taken for Gaza’s Ark at the end of the meeting, to which all are invited to contribute. This ten-minute video explains how the Israeli blockade effects the Gazan fishing industry and why the flotilla is necessary. Organised by Dundee University Action Palestine, Tayside for Justice in Palestine, and the Dundee Branch of the Scottish Palestine Solidarity Campaign. A call for action: Stop the Prawer Plan! On Monday, July 15, thousands of Palestinians protested in their cities, towns and at busy street junctions against the Prawer Plan, in a day that was designated as the national day of rage, or Anger Strike. Dozens of Palestinians were either injured or arrested since July 15 by the Israeli occupation forces, yet the Anger Strike is far from over. Throughout the past week protests have been constant within Palestine, with Beirut in Lebanon and Cairo in Egypt also joining in. We are determined to continue protesting daily and to raise international awareness for the plight of our Palestinian Bedouin brothers and sisters, and the next day of rage will be on Thursday, August 1. We call on international solidarity activists to organize demonstrations on the same day in their own cities, and to spread awareness of the biggest impending ethnic cleansing campaign against Palestinians by Israel since 1948 through writing petitions, sharing information on the Naqab and Prawer Plan, or by any other show of activism. G4S has also been in the news regarding allegations of overcharging a UK government electronic tagging contract by tens of millions of pounds. The UK’s Justice Secretary announced he had called in the Serious Fraud Office to investigate the company’s practices, which involved tagging people who had had returned to prison, left the country, died, had had tags removed or had never been tagged in the first place. What can you do to increase the pressure on G4S? 2. British Gas and Scottish Power have contracted G4S to read and replace gas meters. If you are not happy about this, you have the right to refuse access to your property and request that your meter be read by a representative of the grid company. If you are still not happy, change your supplier and tell British Gas why you are doing so. Eric Burdon performs in Scotland (Edinburgh) tonight in the only UK date of a tour that was to have included a gig in Tel Aviv, Israel, on August 1st. Palestine solidarity activists welcome yesterday’s announcement that he has pulled out of the Tel Aviv engagement “under increasing pressure” to cancel, according to his Manager. The Scottish Palestine Solidarity Campaign was among those who wrote, and invited others to write, to Eric Burdon before he came to Edinburgh asking him to remain true to his long-term hostility to racism and Jim Crow in the US South. We welcome Eric Burdon’s decision to follow in the tracks of Bruce Springsteen, Stevie Wonder, Elvis Costello, Carlos Santana, Gil Scott-Heron, Annie Lennox, the Pixies, Massive Attack and many others in refusing to perform in apartheid Israel. This is another small crack in the wall that imprisons the Palestinian people. He will now be unreservedly welcome in Edinburgh tonight. Appeal from many Scots and others to Eric Burdon to boycott Israel. During June, there will be a Scottish tour to help launch this important new book on Palestine. The tour comes to Dundee on Wednesday 26th June when there will be a meeting at the Tower Building, Dundee University at 7.30pm. Rich Wiles will be speaking on the origins, role and future challenges for the BDS movement as an auxiliary component of the Palestinian struggle for freedom. Rich, the author of ‘Behind the Wall’ and a photographer who has run a skills project in Aida Camp, Bethlehem for many years, is editor of this important collection of contributions from Pluto Press. 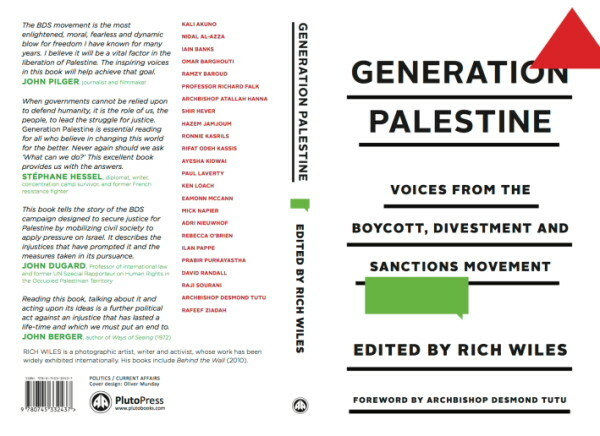 Generation Palestine – Voices from the BDS Movement contains writing from Desmond Tutu, Ken Loach, Iain Banks, Ronnie Kasrils, Omar Barghouti, Ramzy Baroud and others directly involved in this burgeoning movement, including SPSC’s Mick Napier.